What do Sophia Loren, Mariah Carey, Jane Seymour and Karina Smirnoff have in common? They all use nature’s beauty secret - olive oil. 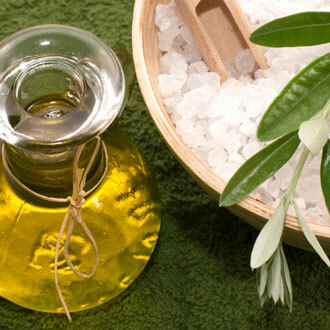 While most people associate extra virgin olive oil with culinary uses, olive oil has been widely used throughout the ages as a beauty product - adding luster to hair, softening skin and strengthening nails. For centuries, people of the Mediterranean recognized the beautifying benefits of olive oil. In fact, the first uses of olive oil were actually on the body and not in it. The Minoans documented their use of olive oil and herb essences for ointments; the Egyptians used it as a fixative for Cleopatra’s perfumes (yes, the very perfumes that helped lure Mark Anthony); the Greeks and Romans bathed in it and slathered it on their bodies. In Italy, the benefits of olio per la belleza (olive oil for beauty) have been carried forward for hundreds and hundreds of years, passed along through time-honored recipes for olive oil potions, elixirs and beauty masks. And now, what these ancient cultures knew is being rediscovered in olive oil-based beauty products. Among all the natural lipids, olive oil is the most similar in chemical composition to the body’s own natural skin lubricant, sebum. Olive oil is completely safe, easily absorbed and has a cell “re-fattening” capacity. Its exceptional penetrating ability locks in natural moisture and prevents dry skin. As an antioxidant, olive oil can naturally target epidermal keratinocytes (the basic cells from which the upper layer of skin is made) and can stimulate the synthesis of collagen and elastin, encouraging firmer and healthier skin. Use olive oil on your face straight out of the bottle (that’s what I do! ); or you can go to step 2. Make a simple emulsion with equal parts of water and olive oil using a hand-held frother. This emulsion creates a perfect balance between water and oil; water rehydrates the skin and olive oil protects the skin from losing its own natural lubrication. Add another ingredient - Italian parsley - to the emulsion. Parsley is considered a natural antibiotic and is thought to combat lurking germs. Water releases the parsley’s benefits and olive oil locks in the moisture. The caveat: you will need to blot off the parsley! Mix ½ cup extra virgin olive oil with 1 tablespoon of coarse-grained sea salt. Massage onto your body; then shower. Apply an emulsion of olive oil and water ...or straight olive oil.